Lots of tools and gadgets have been coming out, with the intent to help people better plan and execute their diets, physical activity and other life skills. Thus, in recent years there has been interest in understanding the clinical impacts of such devices with respect to endpoints such as weight loss. We set out to review current progress on clinical studies involving quantified self. In this article, as of November 5, 2016, we have located and classified ongoing and completed clinical trials registered on ClinicalTrials.gov that are relevant to quantified self in healthy adults. Note that there are many more studies employing related interventions or strategies on people with disease conditions. While those are interesting, here we are diving into studies conducted in healthy individuals. Furthermore, there are other studies regarding things like activity trackers and monitoring over time, that may be published but not reported on ClinicalTrials.gov. Taking the results of all of these searches together, there are 996 registered studies involving these keywords. Since we're concerned with healthy individuals, we see that if the search results are filtered with the search parameter "Conditions: healthy", there are 40 studies remaining. Upon manual filtering, studies were removed if they did not involve self-tracking of physiological or cognitive measures over time, and 12 studies remained. Figure 1 shows a general breakdown of the relevant clinical trials being conducted. Most of the studies involve weight loss, while the next most popular use case was to improve healthy eating habits. Figure 1. 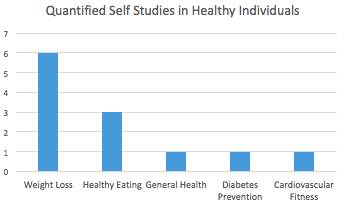 A breakdown of clinical trials conducted involving quantified self principles. One example of a study using quantified self principles involved the use of a mobile app (SocialPOD -- Social Pounds off Digitally), to aid in weight loss.1SocialPOD is an app that tracks activity levels and eating habits over time, and delivers motivational messages to the users to keep them engaged. It is essentially a "coach" for the user. In this study, 50 otherwise healthy volunteers (21 in each group finished the study) with a BMI > 30 were split into two groups, one of which used SocialPOD while the other used the calorie tracking app Calorie Counter by Fat Secret, for a period of 12 weeks. The group that used the SocialPOD app exhibited twice the weight loss (5.2 kg lost vs. 2.2 kg lost, P = 0.02, n=42) compared to the group that used the standard Calorie Counter app. Studies like this show that software that tracks user behavior, analyzes it and gives recommendations to people, are useful and effective to help improve health. While traditionally such coaching is done by humans, eventually once artificial intelligence systems get better, people wanting to get the benefits of coaching can do so by simply interacting with a mobile device. The most popular contexts for clinical trials in healthy individuals using quantified self related interventions were weight loss and healthy eating education. While there are no reported studies involving cognitive tracking in healthy individuals, we think this would be an interesting area of research for future studies. Finally, it's interesting to note that there are nearly 1000 clinical studies that involve quantified self related principles, yet only 12 of these involve healthy adults. While it may be easy to think about devices in the context of treating disease, it's equally important to think about how to enhance your life if you're a healthy person! National Institute of Mental Health; University of Virginia. Providing Personally Tailored Dietary Suggestions Using Individual Microbiome and Glycemic Index Response. In: ClinicalTrials.gov [Internet]. Bethesda (MD): National Library of Medicine (US). 2000- [cited 2016 Nov 5]. Available from: https://clinicaltrials.gov/show/NCT02945514 NLM Identifier: NCT02945514.